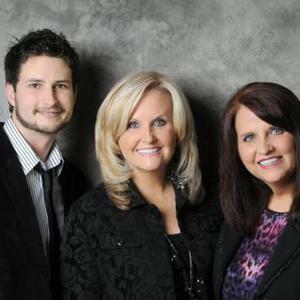 The name of multi Grammy nominated Karen Peck and New River has become synonymous with Southern Gospel Music. Karen's flawless, delightful soprano voice has made its way into the hearts of Gospel Music lovers across the country and garnered an unprecedented 11 Favorite Soprano Fan Awards from the readers of The Singing News Magazine, Southern Gospel Music's leading fan and trade publication. Karen, Susan and Jeff have also received many awards from other magazine publications and Internet publications. Over the past two years, New River has had five consecutive #1 songs in Southern Gospel Music. Finally in 1991, the realization of yet another dream came to pass when Karen and her sister, Susan, with Karen's husband Rickey, organized the musical entourage of Karen Peck and New River. Today the New River team consists vocally of Karen, Susan, and Jeff Hawes. Additionally, Karen's husband, Rickey, serves as the group's road manager and sound technician. Susan's husband, David, is the founder and owner of the Jackson Steel Guitar Company. Dawn Hughes has traveled with the group since year 2000 as Karen Peck and New River's assistant making New River a complete family affair. With appearances on such prestigious stages as The Grand Ole Opry, The Gaither Homecoming concerts, Opryland Theme Park, Dollywood and Six Flags Over Georgia, New River has firmly established their place at the forefront of Southern Gospel Music. Over the past decade, they have been featured on many television networks, with appearances on TBN's Praise The Lord, the Grand Ole Opry Live and the popular Gaither Gospel video Series. The group has enjoyed many honors and accolades. They have received numerous industry and fan award nominations. Their album Journey of Joy received a Grammy nomination for 2008. Journey of Joy was also nominated for three Dove Awards. This album has three consecutive #1 songs including Hey, Last Night, and Whispered Prayers. They have consistently received radio airplay at stations nationwide. Hit releases have flowed their way in bunches, and they have enjoyed many Number One songs. A few of their other popular hits include: Hold Me While I Cry, Just One Touch, I Wanna Know, God Likes To Work, Daddy's Home, When Jesus Passes By, God Still Answers Prayer, and Christian In The House. Additionally, the group's Number One hit, Four Days Late, was also named Song of the Year by readers of The Singing New Magazine in 2001 and the SGMA Awards and continues to be a favorite among audiences. No doubt, that same message of hope and encouragement continues to flow through the lips and lives of Karen Peck and New River with their Daywind release, Ephesians One, released in September 2008. The album, featuring #1 song I Want To Thank You, was nominated for a Grammy in 2009. Each time we go into the studio to record a new album, Karen shares, We're at a different place in our walk with Christ than the last time we prepared for a recording. Therefore, obviously, each recording pulls at a different heartstring, yet the message of hope is always present. That's what life in Christ is all about. As a result of various circumstances each of us have faced over the past years, we're at a point in our lives where we realize that anything we achieve or accomplish is all because of Christ. It is an honor to serve Him. New Rived sets a new standard for musical perfection with rich vocal harmony that is shaded with the sophistication of Southern Gospel, country and progressive musical sounds. New River today stands not only as a talented and successful recording artist, but more importantly, effective messengers presenting the Gospel, through Jesus Christ. Over the past two decades, Karen Peck Gooch has become one of the most beloved vocalists in Southern Gospel Music. Her distinctive soprano voice has earned her the respect of industry leaders and fans alike. In May of 1989, Karen married Dahlonega, GA. native, Rickey Gooch, during the same time she was performing with the successful group, The Nelons. A few years later, in 1991, Karen and Rickey, along with Karen's sister Susan organized New River. With the capable assistance of several other talented musicians and singers, the three developed a first-class group that has earned many honors and accolades. Karen and Rickey make their home in Dahlonega, GA, and have two children, Matthew and Kari. Growing up with her sisters Karen and Sandra, Susan's earliest recollections include listening to and singing Gospel music. She has fond memories of enjoying the all-night concerts that were so popular in Atlanta during the 1960s. She often dreamed of sharing the concert stage with her sister, and that dream became a reality when she and Karen organized New River with Karen's husband in 1991. It was a long-time desire of hers to travel with her family, and that desire has now come to pass since her husband David and her son Joseph accompany New River on their travels across the country. David serves as product manager for the group, and when the three aren't on the road, they make their home in Dahlonega, GA.
Jeff Hawes is a native of Flat Rock, Alabama. He has previously been teaching English for the Jackson County School District in which his most recent position was teaching 12th grade English at Pisgah High School. Jeff began singing on stage around the age of five years old and has always wanted to touch people's lives through song, but it was after his tenure at Troy University, that Jeff's ?gospel dream? became a reality. In 2008, Jeff auditioned with hundreds of hopeful gospel singers for a chance to be on the Gospel Music Channel's hit reality show Gospel Dream. Jeff was one of three chosen to represent Atlanta when the show was taped in Nashville. The show aired in June 2008, and after making it through two extremely tough rounds of competition, Jeff made the top 12 in the nation. After his time on Gospel Dream, Jeff went on to compete in Orlando, Florida for the AMTC (Actors, Models, and Talent) Competition in which Jeff was chosen for their highly esteemed Talent Show. Jeff performed in front of top producers and agents from across the world. While at the competition, Jeff was asked to travel with Stained Glass Marriage Ministries from Birmingham, Alabama in which he played keyboard and led worship for their Praise and Worship Team. Jeff also was hand chosen by Jeremi Richardson of the contemporary group Avalon to sing with the Cleveland Carolers during the 2008 Christmas season. They performed at various venues in the Cleveland, Tennessee area. In March of 2009, Jeff competed in the annual Aaron Wilburn Talent Search at Hoofers Gospel Barn in LaGrange, Georgia where Jeff won 1st place in the Contemporary Christian Division. Wilburn was a huge supporter of Hawes and allowed him to open for one of his shows in Alabama. As a result of winning in LaGrange, Jeff advanced to the National Quartet Convention Talent Search in Louisville, Kentucky where he placed in the top 10. Jeff has a true desire to minister to the lost. His goal is to magnify the name of Jesus and give all honor, praise and glory to His name. He is thrilled to even be singing on the same stage with Karen Peck and New River, and is greatly humbled and excited to be their newest addition. He cannot thank Karen and Susan enough for having the confidence in him and the faith in God to give him this chance of a lifetime. Jeff's favorite scripture is Proverbs 3:6 ?In all thy ways acknowledge Him, and He shall direct thy paths.? Jeff has stuck by this verse during the audition process with KPNR.